The extra mile – one mile too many? Only 600 metres to go! 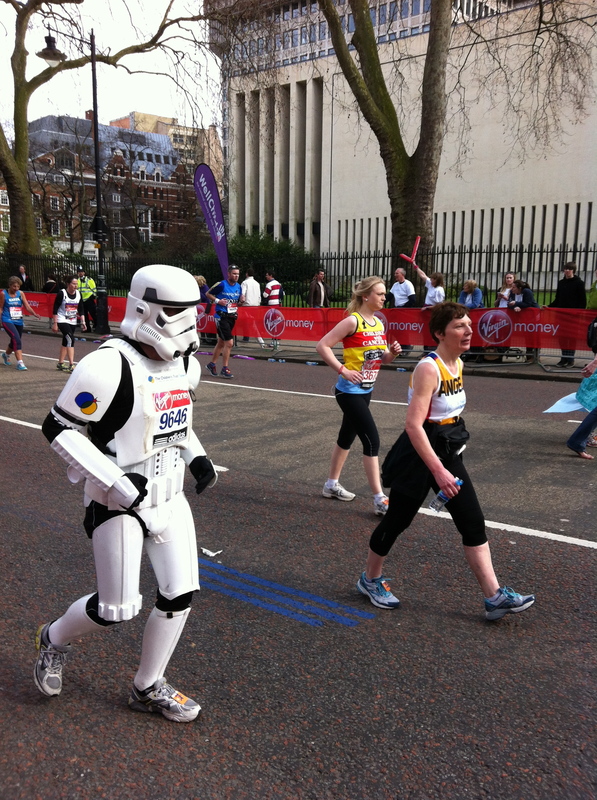 I went down to watch the London marathon last Sunday. Not the elite race (I caught a bit of that on TV in the morning) but the masses that followed on behind – the hundreds tens of thousands of fun runners and fundraisers of all ages, shapes, sizes and colours who, in some cases, dragged their bodies and a variety of costumes (beer bottles, rhinos, tigers, giant flowers, bobsleighs, fire extinguishers, fairies, Supermen, Wonderwomen and many more) around the 26.2-mile course. Yes, there were many who looked pretty relaxed as they jogged past us – we were at the ‘600 metres to go’ mark – but there were plenty of others who didn’t look like natural runners at all, but who finished the course all the same. As usual (I’m a regular at the sidelines of the marathon), it was a moving, tear-jerking, awe-inspiring, life affirming experience that – if you were to try to sum it up in a word – comes down to LOVE. Many people are motivated to run out of love – for their mother, father, brother, sister, son, daughter or other relative, friend or complete stranger who has succumbed to or is struggling with some form of physical or mental illness, tragedy or hardship. Often photos on the runners’ shirts tell stories of love – and of heartbreak. Others show their love and solidarity by stopping to pick up a fellow runner who has stumbled or to walk alongside a struggling participant to the end of the race – irrespective of how that affects their finishing time – or by joining their family members to help them complete the course (I saw a grey-haired mum, in jeans and a coat, propping up her daughter and walking with her towards the finish). And there is love bursting out from the sidelines too – crowds of us went down to watch, undeterred, so the TV commentators said, by the tragedy of Boston (of course we were – was it ever going to be any different?). And even though I would have loved to be running, it was a privilege to be cheering. It’s amazing when the runners say ‘thank you’ when you call their name or when they give you a smile or a thumbs up, despite obviously being in tremendous pain, or when they start running again after a period of walking, apparently lifted by your loud cheers (that’s the ultimate buzz for a spectator). 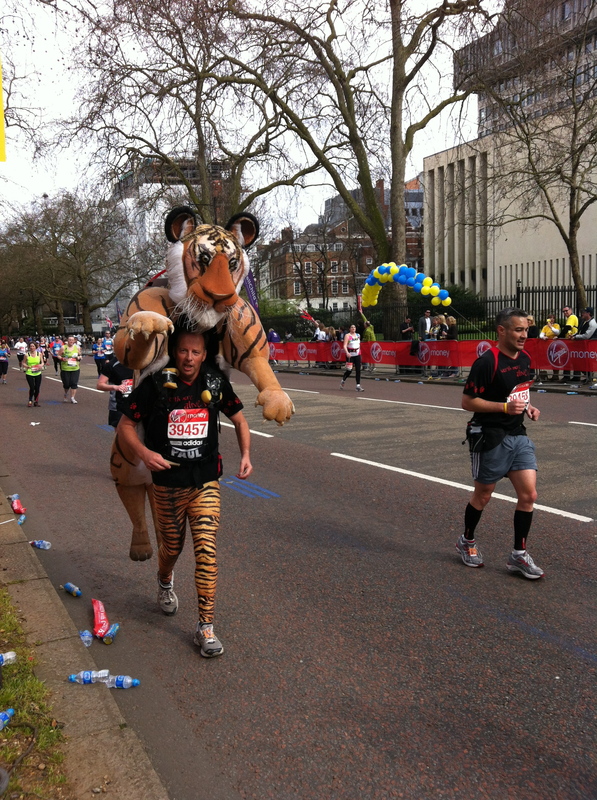 At the risk of sounding clichéd, the marathon, I think, brings out the best of the human spirit. At this point, those of you who know me or who have learned a little bit about me by reading this blog might be wondering why I wasn’t running and why I don’t run every year. Surely the marathon – that gruelling, punishing test of endurance, stamina and resolve and that pinnacle of physical and mental achievement – is right up my street? Of course it is. And I almost ran it in 2006. I trained really hard, got myself fit and was raring to go. Then my Dad died. In fact, he actually passed away when I was out on a training run in the beautiful Calderstones Park, Liverpool. I remember taking off my trainers outside his door and banging them together to get the mud off and then the door opening and being greeted by the face of a family member – or was it a nurse? I can’t remember – that had ‘I’m really sorry but …’ written all over it. At the time, I never considered giving up my training or the marathon. I went running the following day and a few weeks later ran the Liverpool half marathon in around two hours. But then the grief hit me. Like a 10-tonne truck. Like a very hard punch to the stomach. And my body responded not only with tears but also with sickness. I got a bad cold I just couldn’t shake. I was weak, worn out, depleted and stressed. Stressed because I was worried about my training. Stressed because I had to raise more than 1,000 pounds for the charity that had given me a marathon place. And stressed because that’s how I often react to feelings I find overwhelming – I respond by finding a distraction and in this case it was worry and stress about running and money. And then, out of nowhere, came a voice of reason. I didn’t have to run it. I didn’t have to carry on training. I didn’t have to raise all that cash. I didn’t have to do it for Dad. He loved the fact I was fit and active and achieved lots of things (he’d accompanied me to races when I ran cross country for Liverpool in my teens) – but he wouldn’t hold me to this. He wouldn’t want me to do it if it meant illness, stress and unhappiness. So I took what I now see as one of the most courageous and out-of-character decisions I have ever taken. I pulled out. I surrendered. I admitted defeat. I stopped training, stopped stressing and allowed myself some time and space to do some grieving (I say ‘some’ as there was too much to be done in one sitting – I had to spread it out over years). Today of course, and on Sunday as I watched the marathon, a big part of me wishes I hadn’t pulled out. With hindsight, I wonder whether I could have stopped training at that point and still run the race, drawing on the fitness I had built up to date. Then I would have had the marathon experience. I would have known what it felt like to run that course and be cheered on by all those spectators and to have people I love greet me at the end. But I also still accept that I made a brave, rare choice to put my health and wellbeing first – over a major achievement, over a medal, over an unforgettable experience – and I have to cherish that as a good decision and a sign of some maturity. And why haven’t I run the marathon since? Well, that same voice of reason still prevails over what is a very strong desire to live the marathon experience. I fell down some stairs a few years back and injured my foot, which in turn threw off my posture and aggravated a bad lower back. The ankle has never fully recovered. And my knees ache when I pound the pavements following decades of running (mainly in a bid to lose weight) and other sport. In short, I just don’t know whether all that training and the 26.2 miles would be good for my joints even though I know I’d love to run it. Saying that, I’ve been for a short run today and I still love the buzz so who knows what the future holds. But I am writing this because I’ve been thinking lately about the phrase ‘going the extra mile’ and about the logic and sanity of that approach. We’re taught to push ourselves, to stretch ourselves and never to give up – but what if giving up, taking it easy, taking a short-cut and not pushing ourselves is the best thing to do? What if it’s better for our health? What if it’s the path to happiness and contentment? I saw plenty of people going the extra mile(s) on Sunday and was filled with admiration for them. But as I watched those who hobbled towards the finish line in excruciating pain, I did wonder whether running 26.2 miles is for everyone. So when is the extra mile one mile too many? When I look back at my life and mostly at my career, I can see how going the extra mile has carried me very far. The work I have done and the stories I have published have had ‘she went the extra mile’ written all over them. If I’m writing a feature, I’ll aim for the best experts – the ones who are difficult to reach – and I’ll speak to six when two will suffice. If I’m looking for case studies, I’ll keep searching, even if the ones I’ve got are good enough. If I’m walking the streets in search of vox pops (those golden quotes from Joe Public), I’ll keep walking and talking until my feet hurt, my throat is sore and my notebook is brimming with far too many soundbites. The result: very good pieces of work, praise from editors and colleagues, my name in some high-profile publications, a fleeting sense of pride (until the self-criticism inevitably kicks in). But then there’s the stuff you don’t see: missing social engagements because of work, writing late into the night followed by insomnia or worry-filled sleep, working on weekends and the resentment that often causes, sometimes followed by over-eating to suppress any feelings. And, by extension, there’s the singleness, the failure to invest in the personal side of my life over the professional, the absence of joy or activities that bring me pleasure. Not to mention the continued ankle pain because I haven’t made the time to do my physio. I should add that it’s not always this way: I took my foot off the gas this week, didn’t work at the weekend and spent Tuesday soaking up the sunshine in my local park. And today I’m blogging, which isn’t quite work. I’ve joined a pop choir and am going to salsa every Friday. And I’m trying to put some time and energy into online dating. I’ve even got hold of a decent photo of myself to put on my profile. But for the first part of this month, work definitely overtook my life. I remember last week interviewing a friend in South Africa for my book on an evening when I had both an invite to a social engagement (which I missed) and an Internet dating profile to write (which I didn’t do). For me, that interview was going the extra mile. I felt it was important and that it couldn’t wait – I wanted to demonstrate to my agent and to publishers the geographical reach and relevance of my work. At the same time, on the other end of the Skype line, my friend in South Africa was going the extra mile for her work as she has done throughout her career. That’s why she’s achieved so many amazing things. But the irony wasn’t lost on me: there we were, the two of us, discussing being 42, single, with impressive CVs and a similar commitment, dedication and perfectionism around work, but wondering how we had ended up without partners and whether we’d left it too late to have children. I’m pleased I did that interview and that I got a rewritten synopsis and two chapters of my book to my agent the next morning. But I’m aware that going the extra mile in my work means I make sacrifices in other areas of my life – and that if I want those other areas to work out, maybe there are times I need to make sacrifices in my work. So as much as I’m in favour of passion, commitment and dedication to the causes and projects we feel strongly about, I also think many of us need to learn how to say ‘this is good enough’ or ‘this isn’t making me happy – I’m giving up’ (even though that sounds like heresy to me) or ‘I quit’ (can you imagine?) or ‘I’m moving on’ or ‘this time, I’m not going the extra mile’ or ‘I’m heading out to have some fun.’ Of course, this is where balance and discernment come in. If we’re quitting because we’re scared of success or don’t believe in ourselves, then it’s worth pushing through the discomfort. But if the extra mile is going to kill us, leave us with permanent injury or jeopardise happiness in other areas of life, then I reckon it’s worth accepting that good is good enough or even throwing in the towel at the appropriate moment. If this sounds impossible – if we can’t imagine pulling out of the race or never going that extra mile, then it’s important that we learn to pace ourselves. Stop for water breaks, walk for a bit, lean on a lamppost and stretch, look up and catch the eye of a spectator and smile, say ‘hi’ or give a thumbs up. It’ll brighten their day – and yours. P.S. Returning to the subject of work (I couldn’t resist), I’m still looking to speak to women and men for my book – The Baby Gap – as I mentioned in my previous post so do please get in touch via this blog or by emailing info(at)katherinebaldwin(dot)com. Right now, I’m particularly looking for women who froze their eggs or are thinking about this, within the UK and abroad, and for women who have opted for solo IVF or adoption. I’m also looking for women who opted to stay childfree. Many thanks! And happy pacing. 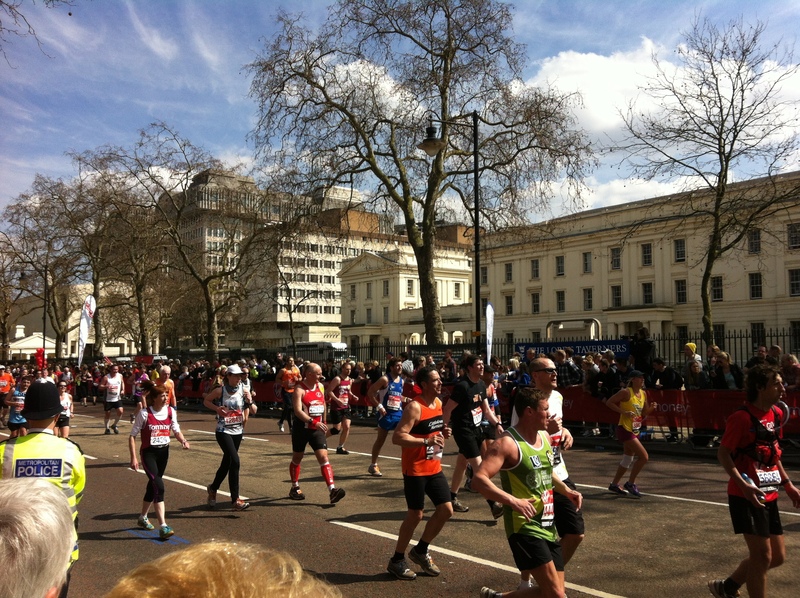 This entry was posted in Happiness, Leisure, Love, Relationships, Uncategorized, Women, Work and tagged Childfree, Childless, Dating, London Marathon 2013, marathon running, Online Dating, running, singleness, Virgin London Marathon. Bookmark the permalink.